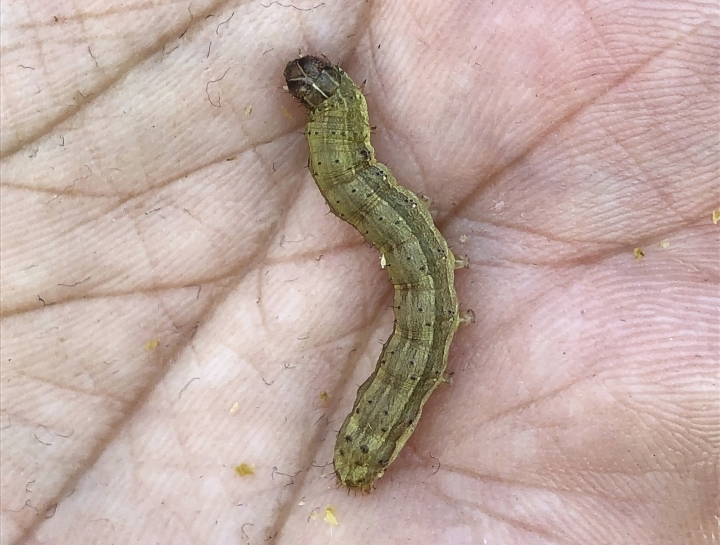 THA MUANG, Thailand — Fall armyworms, a longtime American pest, are munching their way around the globe, raising alarm now in Asia after entrenching themselves in Africa. Experts say the insect was first found outside the Americas in 2016, in Africa, where it has infested up to half of some crops of maize, sorghum and millet. It's now spread through Yemen and South Asia to Thailand and China. This new arrival to her territory worries Uraporn Nounart, a specialist on farm pests at Thailand's Agriculture Department. "We never had this one before. They just were found late last year and in January in this area. It's a big problem," she said while visiting farms recently in Kanchanaburi province, northwest of Bangkok. The worms can cause damage at all stages of a corn crop, but the worst may be when the larvae, pinky-sized caterpillars turn sweet corn cobs to mush. The incursions of the alien species threaten to upend the balance between costs and returns for farmers in Thailand and elsewhere. Pesticides are costly, toxic and don't always work. In its native regions, from Argentina to northern Canada depending on the season, the bug's natural enemies — predators, parasites and pathogens such as bacteria or viruses — help keep it in check. But the new habitats may lack some of those defenses, the United Nations' Food and Agricultural Organization says. It's convening a conference in Bangkok this week to help share information and strategies on battling the pest. 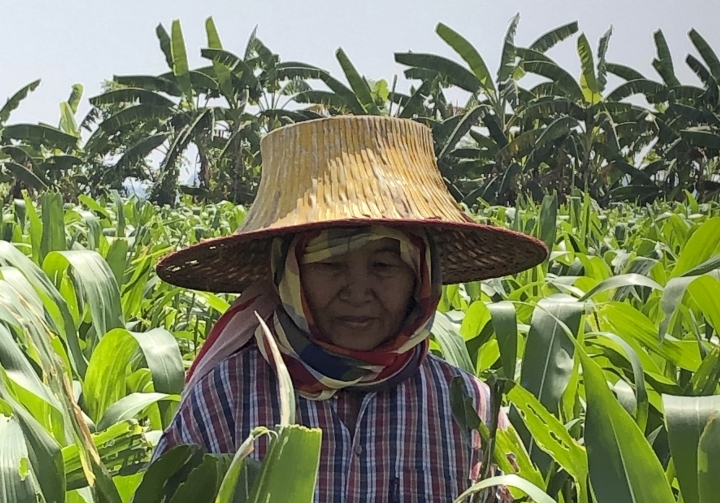 Keeping it in check is an urgent priority: Even though Asia is mostly known for rice growing, maize is an important staple crop and crucial source of feed for poultry and livestock. 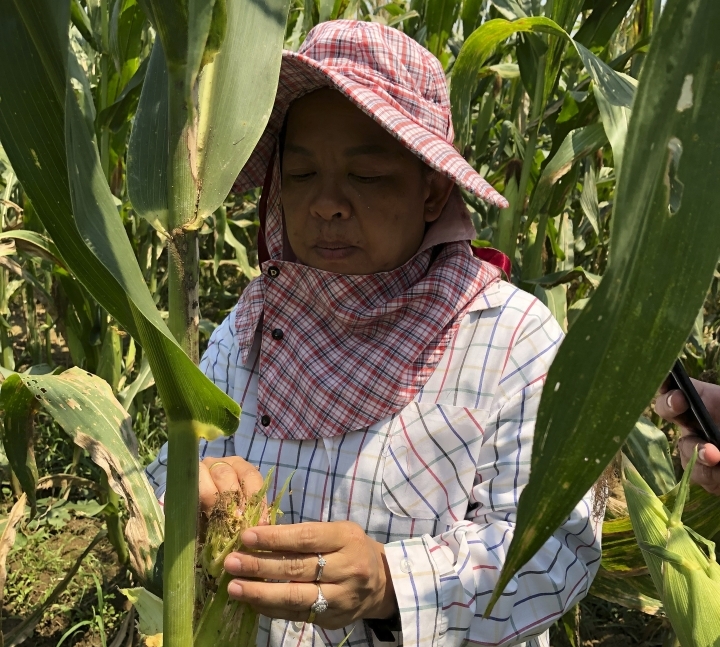 In the cornfields in Kanchanaburi, there were armyworms in all stages of the crop, from seedlings to knee-high to "elephant's eye" high. Some local farmers were working hard to limit their losses by pulling the tops off stalks grown for baby corn and discarding them to limit how much damage the worms could do. That tactic causes the plant to sprout new ears that can be harvested later. Organic farmers don't use the usual farm chemicals so they can sell the waste corn stalks as cattle fodder. 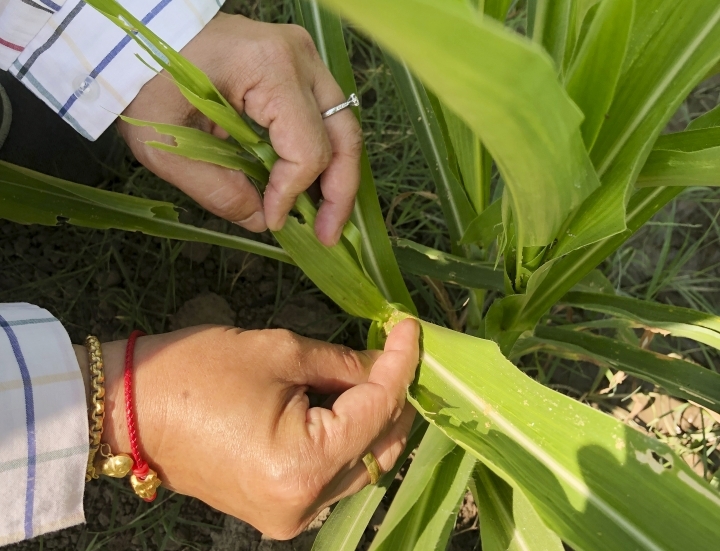 Spraying with biomaterials like fungi and thread worms that may be parasites of the worms can help, but some fields still lost about a third of the first baby corn harvest. 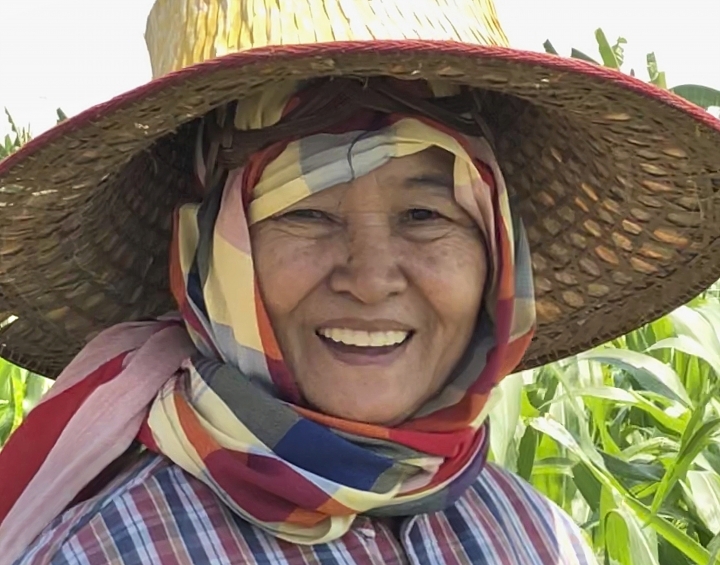 "We've never seen anything like this," said one farmer, Sanae. In another field, Thanwa, a younger farmer, sought help and had his fields sprayed using drones. For taller plants, that's about the only way for the small-scale farmers to get pesticides up onto the affected parts of the plant once the worms are established. Swaddled against the burning sun, Uraporn Nournart and her team of young scientists scrambled through the fields, peeking into corn husks and pulling apart damaged stalks to collect worms and eggs for monitoring. 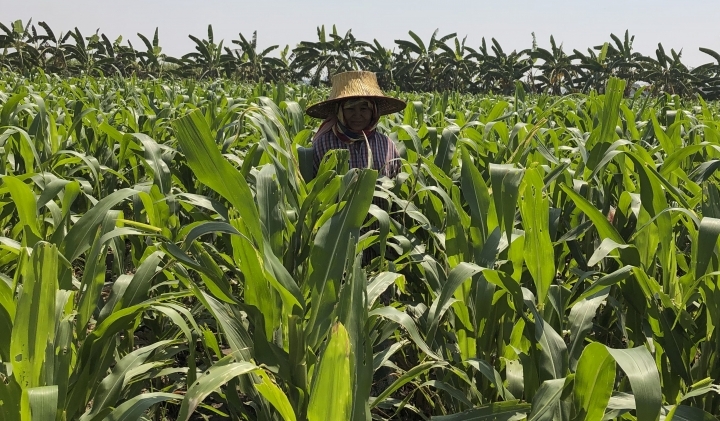 They're conducting trials in fields like the one Sanae was working her way through, a tranquil plot of waist-high corn ringed by banana trees. Charuwat Taekul, an entomologist at the Department of Agriculture who specializes in microscopic parasitic wasps, was collecting egg clusters to use in his research into natural enemies of the worms. It's unclear if such wasps would be effective in keeping the fall armyworms under control, but it's one of various strategies being considered. "Putting into place adequate management measures once a country gets invaded by FAW is important," said Marjon Fredrix, an expert with the U.N.'s FAO based in Bangkok. "However, the likelihood of further spread is real." She notes that the worm's adult moths can fly more than 100 kilometers (60 miles) a night, even farther if they're carried by the wind. The best case scenario, says Fredrix, would be farmers successfully scouting for and finding the worms early on, so they can keep them under control. The FAO has developed an app that teaches the basics of how to find and deal with fall armyworms. "This new pest needs to be managed in years to come, and farmers will need to develop skills to do so in a sustainable manner," Fredrix said. The help came a bit too late for Yodsapon, a farmer in Tha Muang. He follows Uraporn's team stoically as it winds its way through his wrecked field of sweet corn. At first glance, the 2-meter-high (6.5-foot-high) stalks look vigorous, with good-sized ears that are nearly picking size. But a closer look shows holes in the stalks where the worms have worked their way inside, munching ear after ear into yellowish brown mush. The family has other sources of income, a small eco-hostel set in their tropical garden. But income from that is unstable, and the corn crop will be missed, Yodsapon says. He's thinking hard about what to do next: switch to another crop? Cassava? Potato? A good harvest from the field would have netted 2,000-3,000 baht ($65-$100), he says. He expects no income from this one, and spraying repeatedly to try to vanquish the worm could triple his costs. "In that case, I can't afford it," he says.